Design of manure storage and treatment facilities requires an understanding of the operations involved in food animal production and engineering design principles. It also requires access to manure production data, climate data, as well as reporting and presentation software to put it all together. 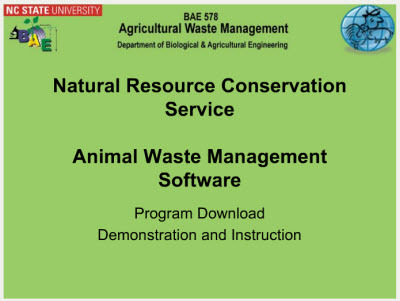 The USDA Natural Resources Conservation Service created the Animal Waste Management computer program to bring all of these features together. This software has been used by consultants and government technical service providers for a number of years in designing storage and treatment facilities for animal production operations all over the country. The 2008 EPA CAFO rules cite this tool as part of the procedure to determine if a facility will discharge animal waste. Just as no engineering design software is simply plug and play, this software tool requires an understanding of the operations involved as well as experience with using the tool itself, its features and its limitations. This training video describes the basic features of how to use the software, from download to final design. Here you will learn about each screen of the tool and how each component contributes to the facility design. You’ll also learn about the data needs of the software and how to edit the native data set used by the NRCS developers of the tool.